This map gives an overview of the major waterways in Maryland. 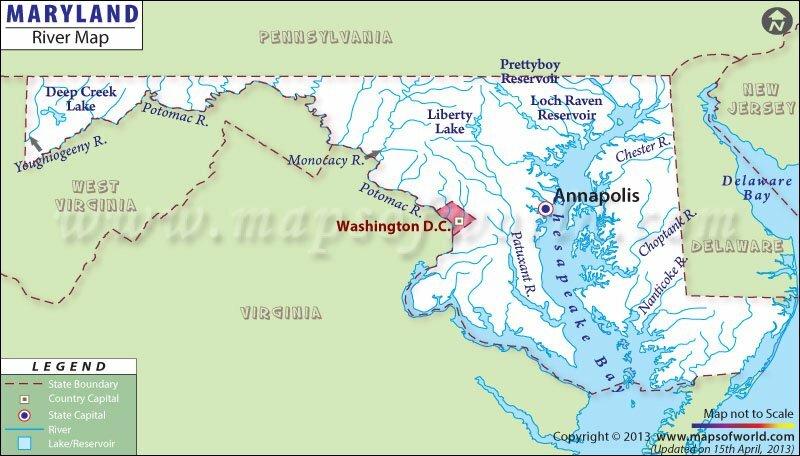 Maryland possesses a number of rivers such as Patapsco, Susquehanna, Potomac and Patuxent which cross the entire state. While the major part of western Maryland lies in the watershed of Mississippi river, the Eastern Continental Divide also intersects the western region of the state. The Chesapeake Bay is the point where the major rivers in Maryland drain. The Bohemia, Chester, Monocacy, Blackwater, Youghiogheny, Susquehanna, Sassafras, Tred Avon, St. Mary's, Anacostia and Nanticoke rivers are considered to be some of the important perennial resources within the state. With 173 square miles of drainage, the Anacostia river possesses northeast and northwest branches as its main tributaries. Apart from rivers, Maryland also has several natural lakes. Deep Creek Lake, Loch Raven Reservoir, Lake Oakland and Prettyboy Reservoir are shown.